We enjoyed our time in Split with its bustling street life, tiny lanes full of all kinds of shops and cafes and a well-preserved Roman palace and fortress. It’s a lot more laid back than Dubrovnik and prices were far more reasonable. Once again our Airbnb abode was excellent. Central to the main area, stylishly appointed, and with all the comforts of home, we were able to live like kings, save money on the basics, and use the extra funds to try out some of the excellent craft beer on offer. Seriously guys. If you haven’t opened a free Airbnb account yet so you can see the value on offer in some of these awesome locations when compared with the prices of Hotels and the lack of security in hostels then what are you waiting for. Open your account with THIS LINK and you’ll get the equivalent of around $55 AUD off your first booking. You can’t ask for better than that. 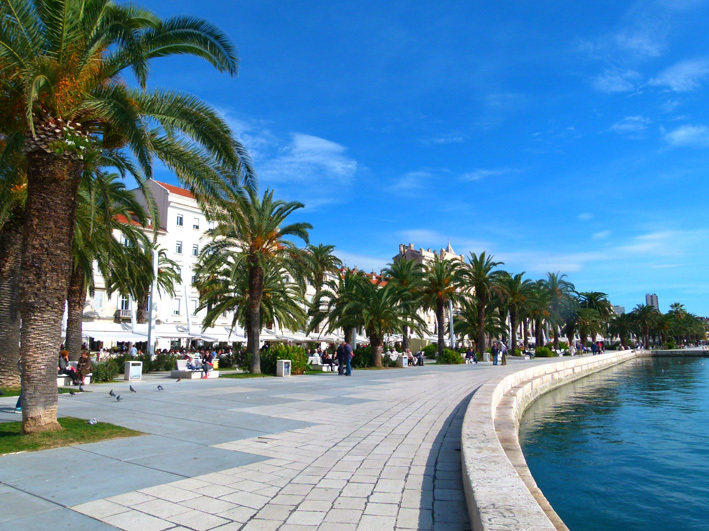 The esplanade along the waterfront in Split. A happening place both night and day. However, we were well aware that our time in Central Europe was coming to an end and we needed to get our bikes to England so we could board a yacht in the Caribbean in a few weeks. Any place with craft beer is a good place for me! And a good job they do at it as well! Our greatest hurdle over the next few weeks was the lack of information about whether we could take our bikes on the trains or not. It was always “we can sell you a ticket, but, it’s up to the conductor if he will let you take them on the train”. That always meant we’d have to wait till the train was about to leave so that we could meet the conductor and plead our case – not a good position to be in with limited time. 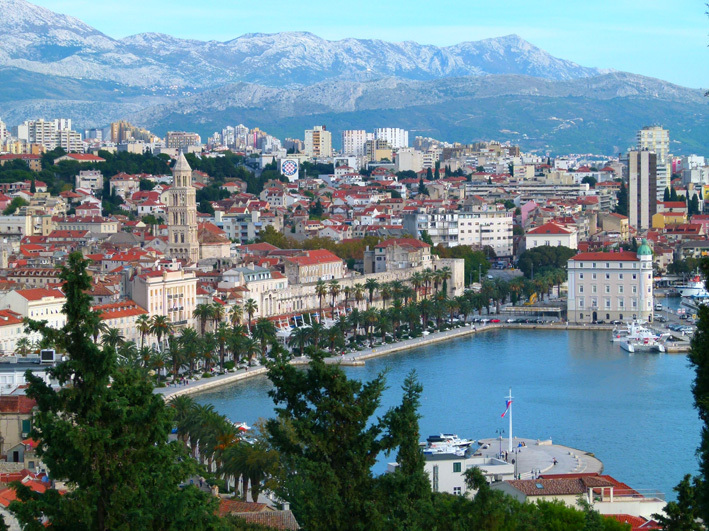 Split Old Town and waterfront, a very pretty place. Fortunately, the female conductor in Split gave us the nod and off we went. Every great city should have a healthy craft beer scene! Zagreb we found most agreeable. 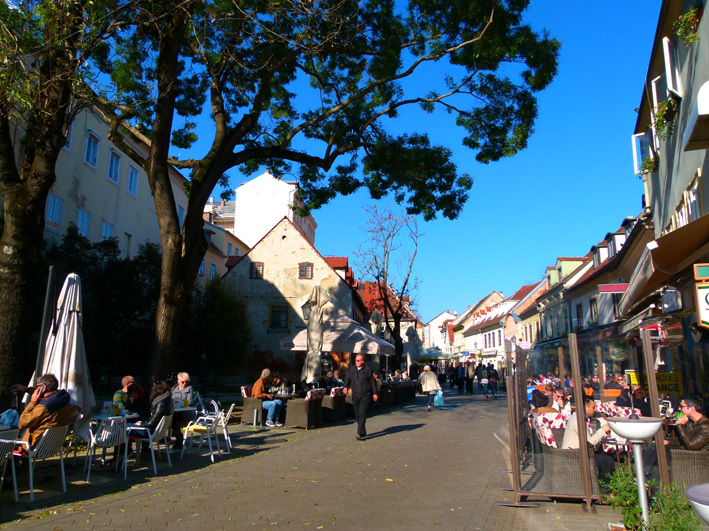 It’s not a large city, so it’s walkable – we like that. It’s also not as expensive as much of the rest of Croatia so we managed to find a few good places to enjoy a beer and a hot dinner. 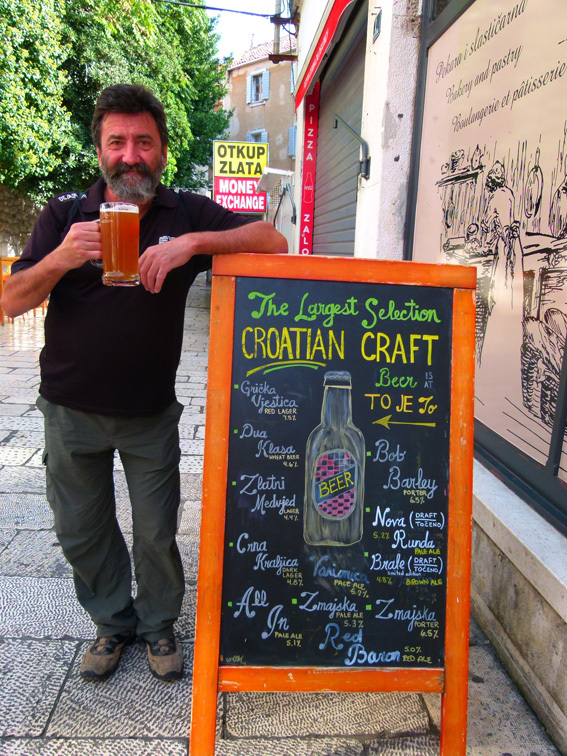 Tkalčićeva Street is lined with some great places to enjoy a craft beer and watch the passing parade. The Upper City has some great architecture and views over the Lower City and beyond. 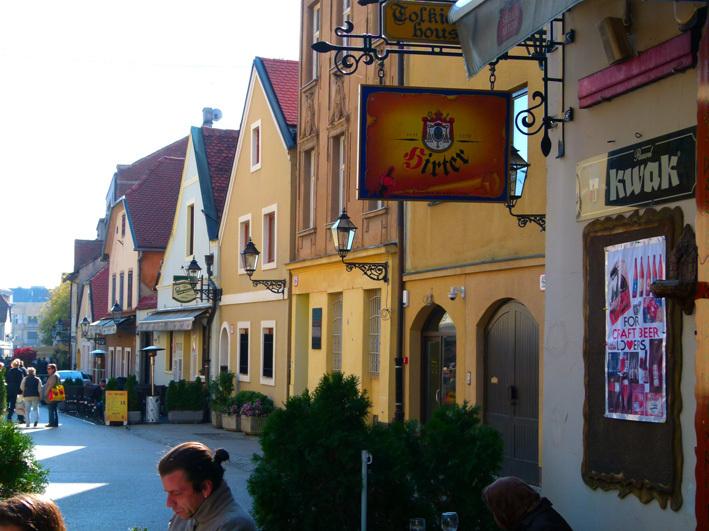 Tkalčićeva Street is lined with cafes and restaurants and a few places to enjoy a craft beer. Needless to say, it’s very popular! Cycling around the city isn’t difficult either, as long as you stick to the smaller side streets. Upon leaving we found that it was a good idea to let Sharyn “chat up” the conductor for permission to load up our bikes onto the train. The “Women’s Touch” can be quite useful when dealing with officialdom. Once it was agreed upon I quickly lifted the bikes into the designated carriage while Sharyn went hurriedly inside to buy our tickets – all with about ten minutes to spare! 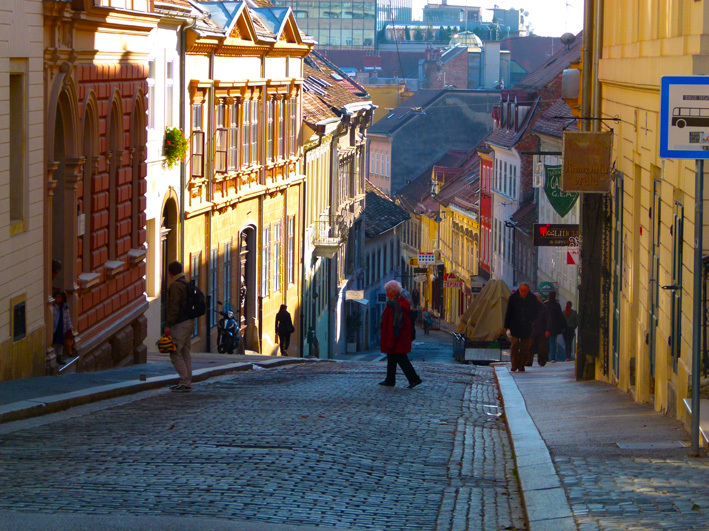 The Old Town sits up upon a hill overlooking the rest of the city. 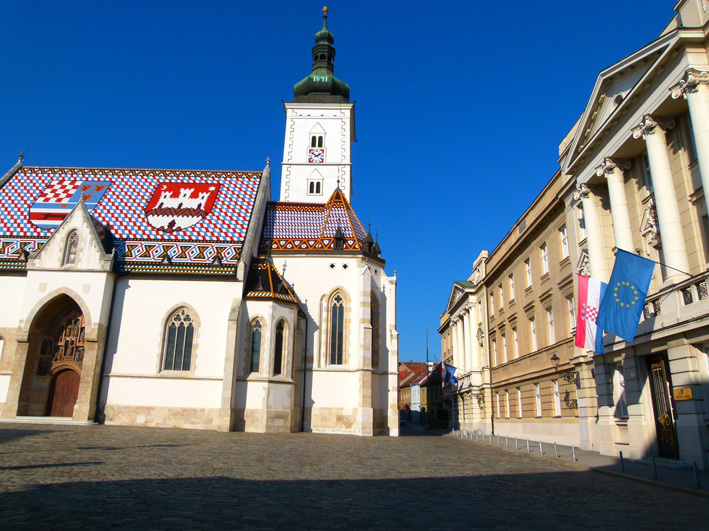 The mosaic covered St. Mark’s Church in Zagreb Old Town. We were headed back to Belgrade to pick up the rest of our gear from our friend who stored it for us while we cycled the Dalmatian Coast. Croatia had recently closed all but one border with Serbia because of the migrant crisis there. Fortunately, the train was still running. We must move on, winter is coming! 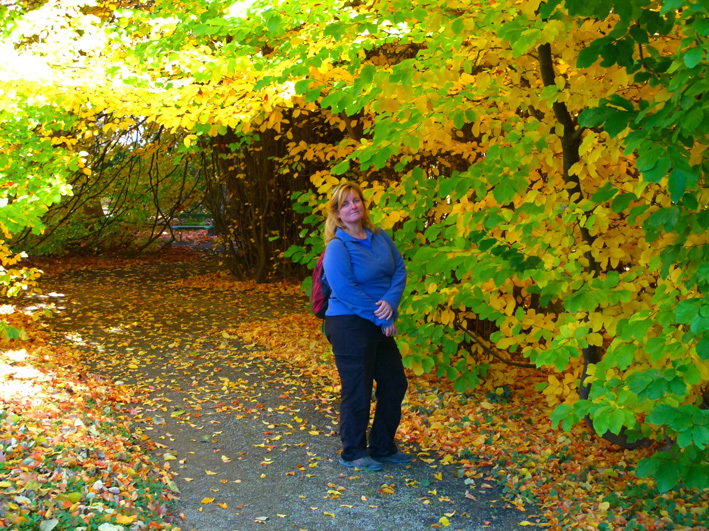 Sharyn in the park. It was an overnight train to Belgrade and we arrived at sunrise to a rather dark, gloomy city preparing for rain. Over the next few days, we organised getting the rest of our gear from our friend and booking tickets to Budapest on the train. Once again, we’d had to talk to the conductor first. I went down to the train the afternoon before and asked him if it was OK to take the bikes on – better safe than sorry! In very limited English he said it should be OK, but we’d need to check again in the morning! Wow, nobody wanted to commit, we’d never know until right up to the train was about to leave! 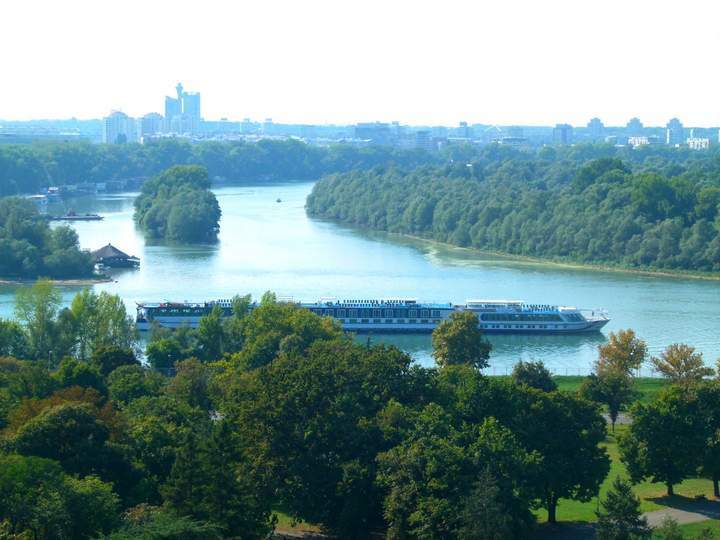 The confluence of the Danube and Sava Rivers in Belgrade. We really enjoyed Belgrade, we walked a lot, as usual, and even took the bikes for a day out up to the Zemun area north of the main city. Our friends also took us to a craft beer bar called “Samo Pivo” for a night out and to meet some others as well. It’s a slightly less salubrious place than other pubs but has lots of character. With over twenty taps to choose from nobody’s complaining! 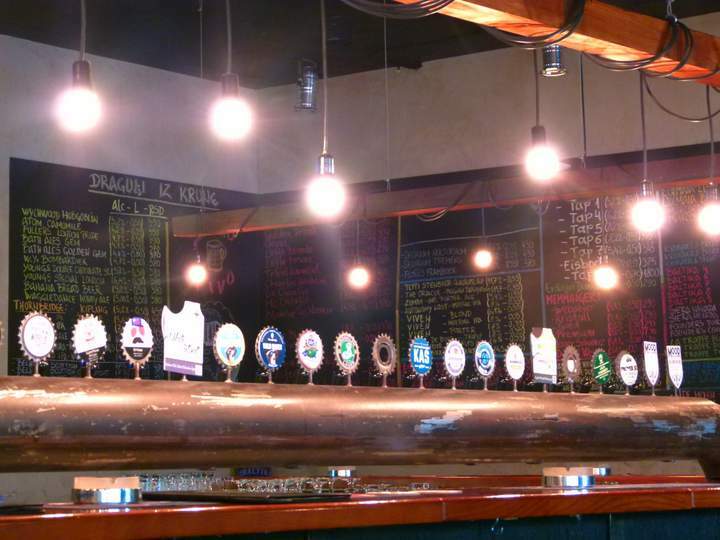 Samo Pivo, a great place to enjoy craft beer in a relaxed, informal atmosphere. Belgrade Railway Station was guarded around the clock by Police with automatic rifles. This was probably a good thing as there were a lot of dodgy, undesirable people lurking around, most of who were fairly inebriated at this early hour of the morning. We managed a couple of coffees while keeping a close eye on our bikes and gear. The conductor gave us his approval and we sighed with relief as our last train ride with the bikes was assured. The only hitch was a train change just over the Hungarian border where we had to lug our bikes and luggage around 200m up the station. Exhausting but once on board, everything ran smoothly to Budapest. The countryside between Belgrade and Budapest is predominantly flat, the only noticeable feature was Hungary’s brand new border fence built to ensure refugees were turned in another direction and not to be accommodated in Hungary. 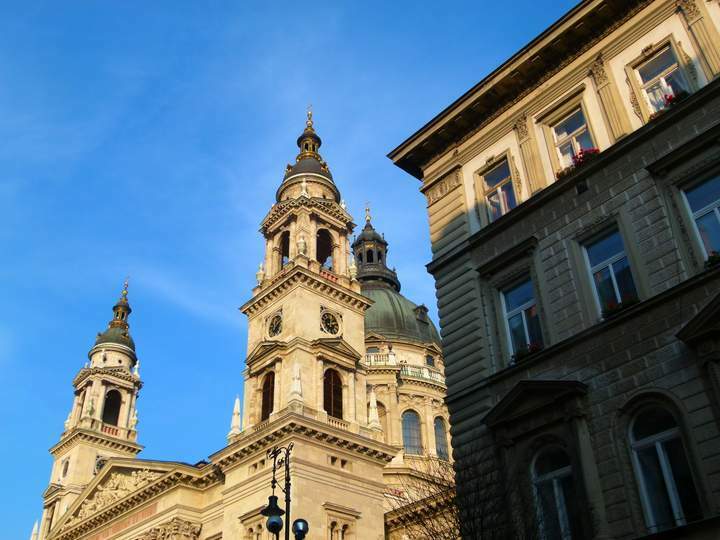 St. Stephen’s Basilica on the Buda side of the Danube. 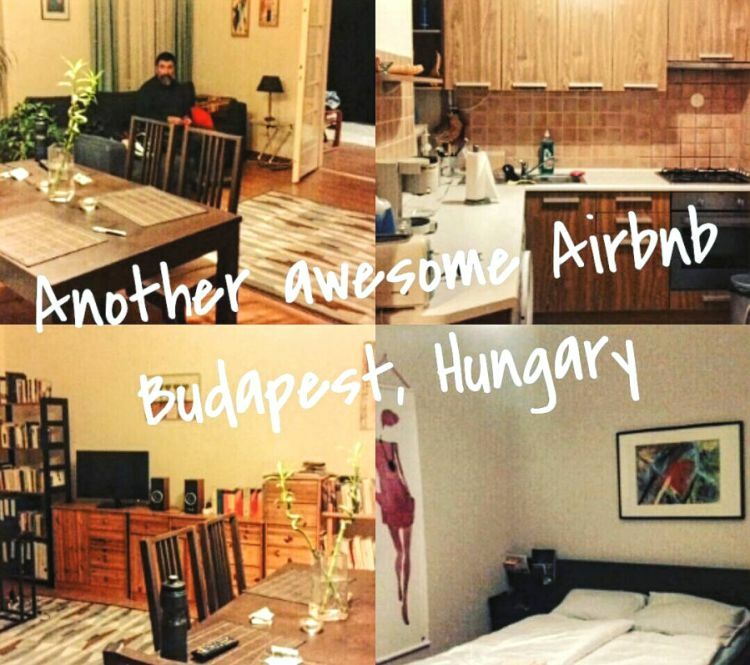 We arrived in Budapest’s cavernous main railway station, re-loaded our bikes and made our way to our Airbnb apartment in District 7, not far from Octagon. The apartment was fantastic and close to everything. We would enjoy the next ten days before flying out to England and the Caribbean. 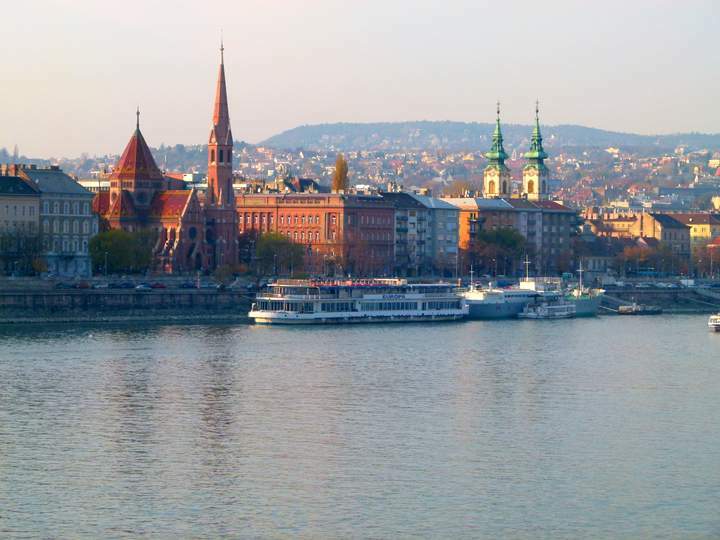 Across the Danube in Pest is the Hungarian Parliament building dominating the riverbank. 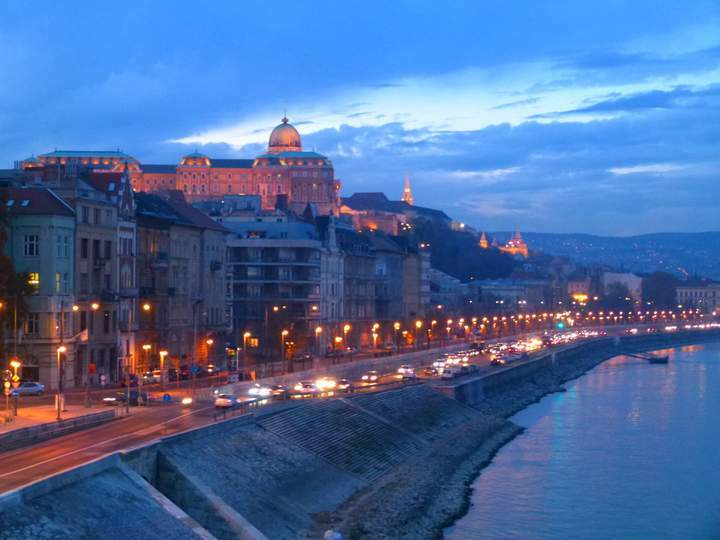 Budapest is a very pretty city, especially at night, and along the Danube. With all the buildings lit up it was really something to see. Being November, a lot of Christmas decorations were being put up. Down towards the Danube market stall were being set up in a public square. They were selling everything from arts and crafts to food and drinks. 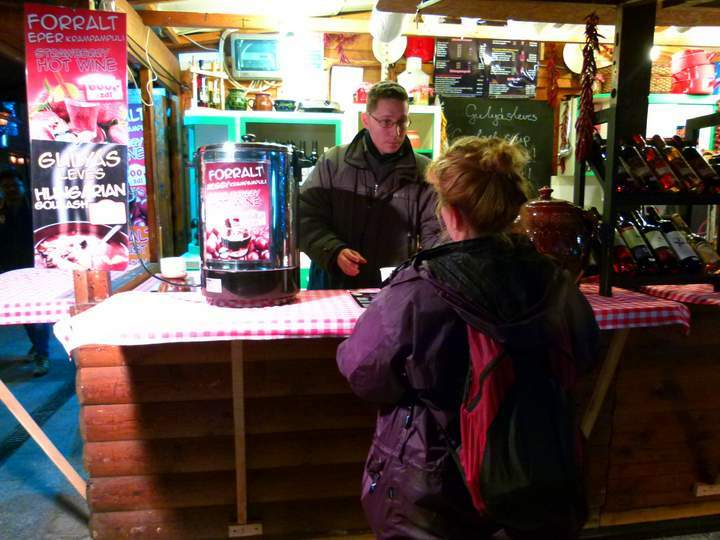 The weather now was getting colder and, to our delight, we found a stall selling mulled wine. What a great way to warm up! Sharyn and I would be back again on a few occasions. The amazing Széchenyi Chain Bridge, one of the famous 8 bridges of Budapest. Legfelsőbb Beeróság has an extensive range of Hungarian Craft beers. We were regular visitors! One of the features of the Budapest social scene is the Ruin Pubs. Old buildings (even just apartments) converted to stylishly looking drinking establishments – the harder to find, the better. Our favourite bar was Legfelsőbb Beeróság at Dohany Utca 20 in the Jewish Quarter, a few doors up from the Champs Sports Bar. 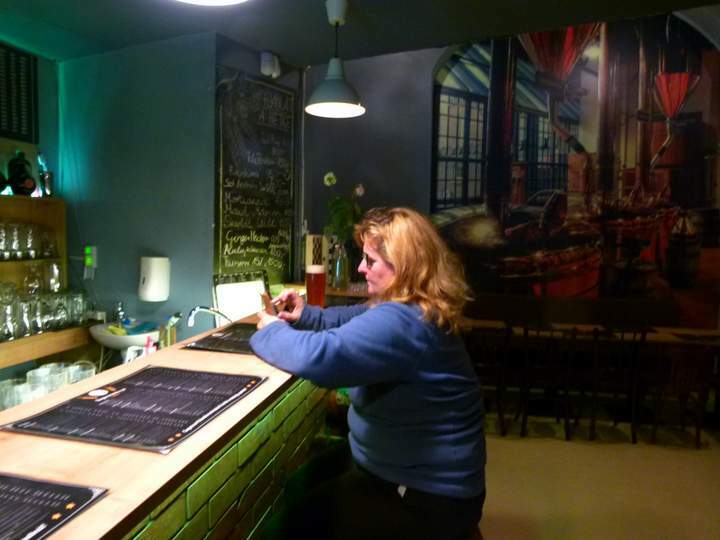 It’s a tiny, bolthole bar selling 150 Hungarian Craft beers. They have ten on tap and the rest in the fridge. A great little place to drink. Palace and Parliament buildings on the Pest side of the Danube at twilight. Hungary is also a great place to eat in the colder months. Goulash and similar, hearty dishes are ubiquitous, washed down with a couple of shots of Palinka of course! 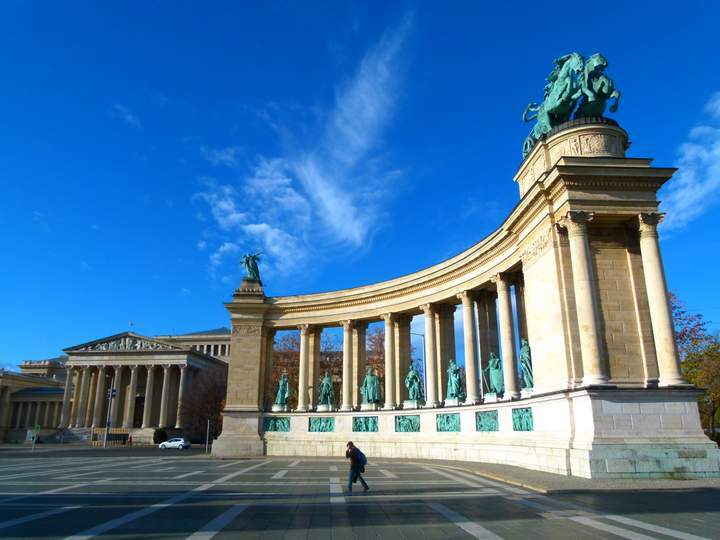 The spectacular Heroes’ Square and the Millennium Monument. With winter and Christmas almost upon us, the warm mulled wine was a great discovery! It was nearly time to go. Our time in Budapest raced by us. 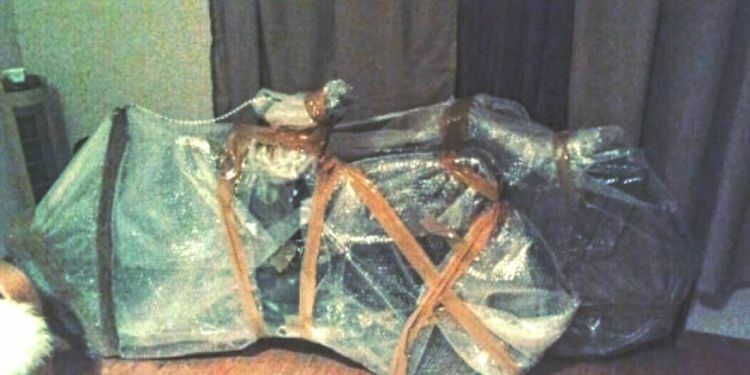 Instead of boxing our bikes this time, we’d wrap them in plastic and bubble wrap that we procured from a hardware shop. We’d read about other cyclists doing this and were a little concerned at first about how protected they’d be from heavy-handed airport staff. I’m glad to say everything went swimmingly. The idea is that they can see it’s a bike and treat it more carefully. Nothing was amiss when we checked in England and getting them to fit into a hatchback meant we didn’t need a van either – happy days! In England, our first priority was to see the bikes safely to our friend’s warehouse where they’ll be waiting for us in early 2018. It’s a great relief to have them securely packed away and easy enough to get to again. With the bikes taken care of, we spent the next week visiting friends in Brighton and London. 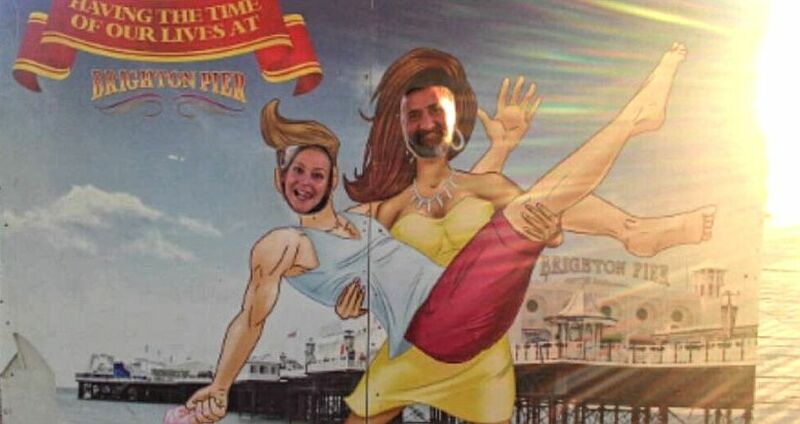 We love visiting England and knowing people there is a great bonus. 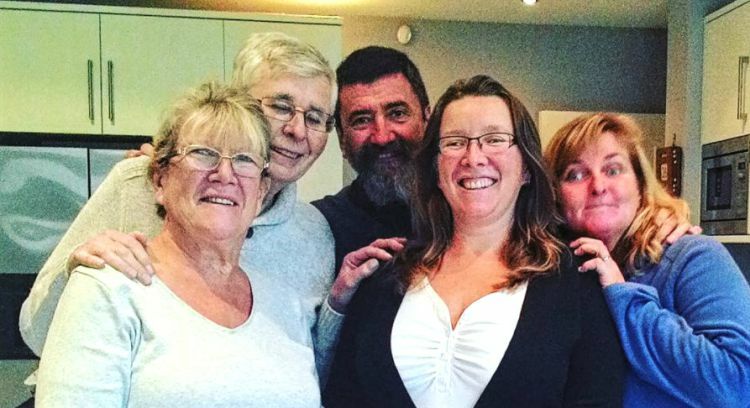 Always great to catch up with friends in the UK. Having been looked after like royalty and finding out all the latest news, we finally boarded a plane headed for the Caribbean. However, our first port of call would be Dusseldorf in Germany for a few days. We figured it would be a good place to see as we’d never been there before. The city was well and truly preparing for Christmas, decorations were hung in every public place and adorned most buildings. It was a cold, bleak and rainy morning as we set off in the dark to look for a taxi to the airport. We’d be flying to Curacao (just above Venezuela), then onto Bonaire and the beginning of our sailing trip around the Caribbean Sea, a four-month adventure and our first time on a sailing yacht in open waters. Let us know what you thought of our European cycling Adventure in the comments below. Did we wimp out on the riding or did we play it smart?